Every dog loves to chew, some more than others and it can be quite a job figuring out how to stop chihuahua chewing on your expensive rug or electrical wires. Understanding why your dog feels the need to chew is the first step in controlling the problem. There is always a reason for chewing. There are five main reasons why a dog chews. Once you identify which one affects your pooch you can direct his chewing or limit it. You can’t stop a dog chewing altogether, because it is a natural instinct. The goal is to rather restrict chewing. Teething. This can be a very uncomfortable time for any puppy. The gums get red, sore and irritable and the only way to relieve the discomfort is to find something to chew on. Boredom. Chewing passes the time if there is nothing better to do. Nervousness. A dog may chew as a way to pacify itself if it has a nervous disposition. Exploration. A dog naturally uses its mouth to explore the world. They lick things to get information through taste receptors. Habit. Chewing might just be a bad habit that continues because it has gone unchecked. Humans chew their nails or fiddle with their hair, and dogs lick, chew and paw. These behaviors can be completely unconscious once they become entrenched as a habit. Now that you know why your dog is chewing you can remedy the situation with a bit of dog psychology. Teething chew toys. Always provide plenty of chew toys for a teething puppy. The ones that can be popped into the freezer are particularly effective as the cold temporarily numbs the gums and provides instant relief. Daily stimulation. Even a chihuahua needs daily walks to provide mental and physical stimulation. Dogs like to sniff everything and this gives them feedback on the world around them, much like humans read the newspaper or listen to the radio. Lack of exercise can lead to destructive behavior like chewing. Calming a nervous dog. 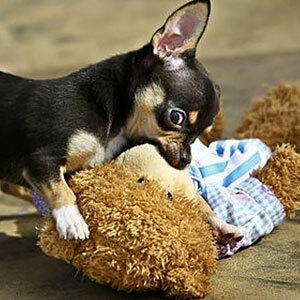 If you suspect that your chihuahua chews out of nervousness you will have to take steps to calm him down. Be consistent, firm and kind with him and show him you are in charge. If he thinks he has to be the pack leader and take care of you instead of the other way round, he will be stressed. Dogs want and need to find their place in the pack. Being the top dog is way too much responsibility. Training to stop chihuahua chewing. Make your dog understand right from the beginning that chewing on anything but his own toys is unacceptable. Fingers, clothing and furniture are not chew toys and should be consistently replaced with more appropriate things. Chewing can be dangerous as well as annoying and destructive. Try to understand your pooch from a dog’s point of view and then you will know how to stop chihuahua chewing anything unsuitable.